As Grumpy discovers, it's much easier to tell other Care Bears to ask for help than it is to do so himself. And although this lesson is learned after the bears realize that it's also a good idea to tell their magical tummies that one helping of ice cream is enough when faced with a Cloudy with a Chance of Meatballs-style endless supply, it still doesn't fail to inspire audiences to process the moral of each amusing story. Promoting caring, manners, empathy and “emotional intelligence” from start to finish, in this adorable Care-a-Lot adventure from Lionsgate, we're treated to eight rainbow ice cream colored episodic helpings of the popular television series centering on themes involving the verb "help." Whether it's something as simple as realizing that a guest who doesn't help put things back can overstay their welcome or something as complicated as trying to put others' feelings before their own in a heartfelt episode where Oopsy learns he can't give Twinklet a home, the appealing, positive, and genuinely entertaining selection of episodes is a standout among the stellar Care Bears releases. And boldly, the disc meanders into subtle green territory by tackling the topic of restoration of the once beautiful landscape of Rainshine Meadows, in a way which doubles as a call for community parks involvement. Likewise, one vignette in particular may attract parents even more than kids as we're reminded that being overprotective can be far more dangerous than having a carefree attitude. 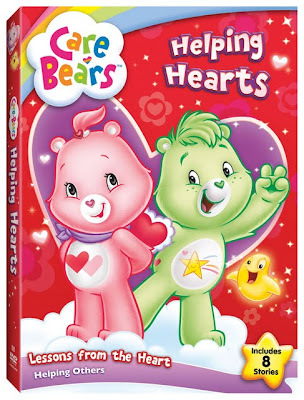 To this end, Care Bears: Helping Hearts takes its own non-preachy advice and employs it via the DVD's “kid-friendly” set-up as-- similar to Disney's FastPlay-- it allows parents some time to get things done as the disc begins playing automatically, moving from one episode to the next without the need for a remote control or constant supervision. While obviously, it's best shared with children possibly sans ice cream since you may not be in the mood after the disc's opener, Helping Hearts which also boasts a trailer gallery, nonetheless provides terrific food-for-thought as a conversation starter about what the Bears of Care-a-Lot learned, what they laughed about, and why sometimes being able to ask for help is the most helpful lesson of all.